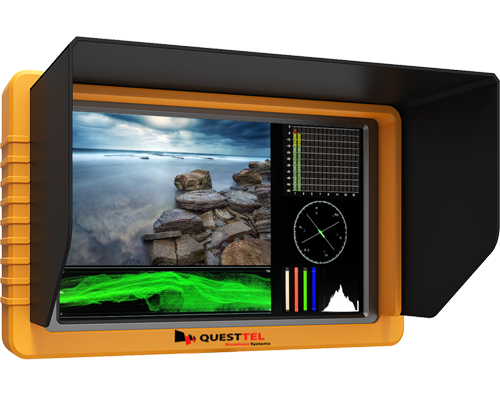 QuestTels B-19-MN8-S-RC is designed for use in monitoring multiple input feeds from various sources to a 1RU rackmount system. 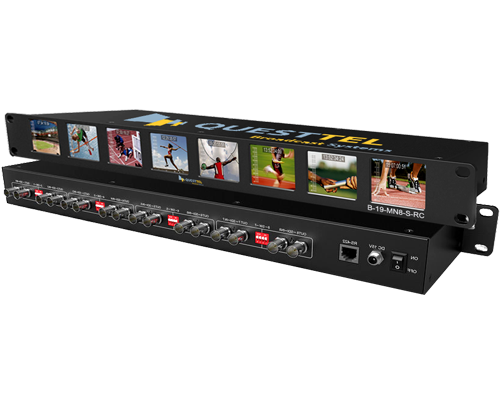 Featuring compatibility with 8x2 individual 3G/HD/SD-SDI feeds. 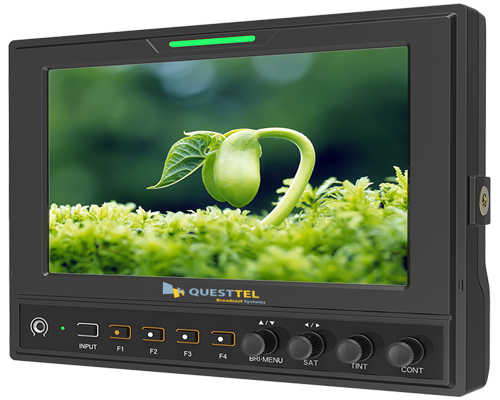 3G-SDI/HDMI Broadcast Monitor - 7" widescreen metal framed LCD field monitor with 3G SDI and HDMI input and output and peaking, focus assist, wave form tools and false colour filters support. B-MN5-SH-CR features 5.5" 16:9 ISP panel with 1920x1080 full HD resolution (401ppi), 1000 1 high contrast, 160 wide viewing angles, 450cd/m2 high brightness, which offers outstanding viewing experience and a lot of features - column(YRGB peak), time code, waveform, vector scope & audio level meter. 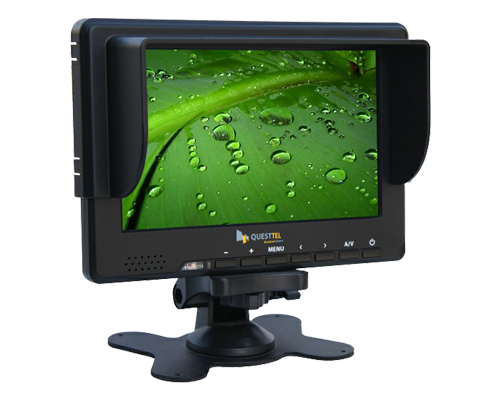 7" 3G-SDI Monitor - 7" 16:9 LED with 3G-SDI, HDMI, YPbPr, CVBS - The 7 inch screen gives directors and camera men a larger view finder, and the 16:9 aspect ratio complements HD resolutions. B-MN7-SH is supplied with all the accessories you need - shoe mount adapter, sun hood, HDMI cable and remote control, saving you a great deal in accessories alone. 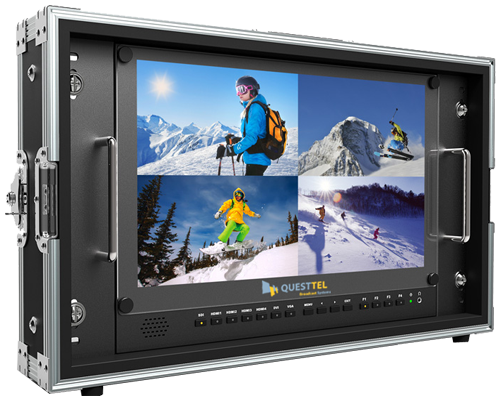 The QuestTel B-MN15-SH-4K is a 4K resolution monitor with HDMI,SDI, VGA, DVI and Tally input connectivity. Designed for the professional video and film industry and is ideally suited for directors and camera operators operating 4K capable equipment. 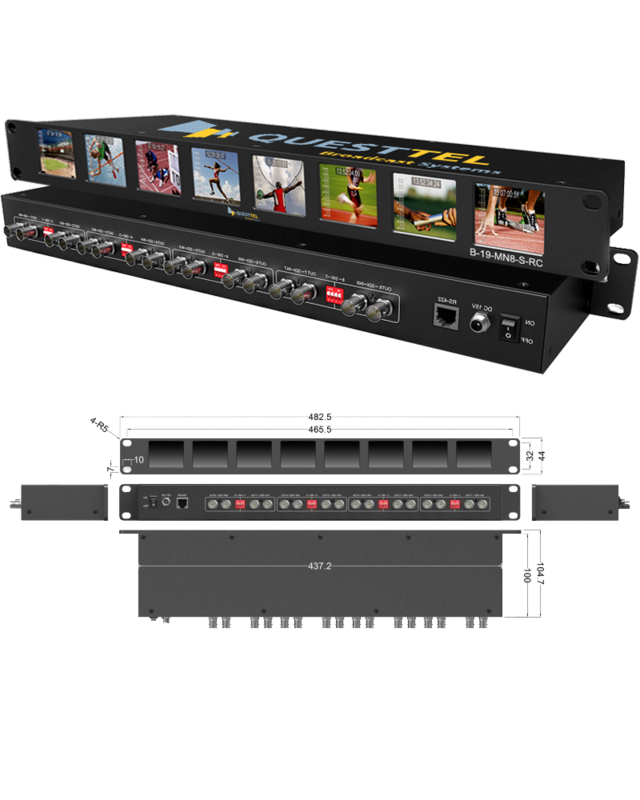 QuestTel's B-19-MN8-S-RC is designed for use in monitoring multiple input feeds from various sources to a 1RU rackmount system. Featuring compatibility with 8x2 individual 3G/HD/SD-SDI feeds, it has an SDI equalization re-clocking and equalization function - meaning that you can run input signals from the source to the monitor of longer cable lengths and the monitor will effectively reboost the signal for onward usage.